CNN asks: Should the 'beautiful game' be called football or soccer? LONDON, England (CNN) -- It's time this debate was settled once and for all. Football or soccer? What do you think the round-ball game should be called? While it may be a basic discussion; arguing whether the beautiful game should be called "football" or "soccer" is one of the most fundamental debates of the code. On the face it, the answer should be simple. The world body -- FIFA -- has the word "football" in its title. End of story? Not quite. The term soccer was coined as slang for "association," in England in the 1880s. The Oxford University Association Football Club's Web site explains that former England captain Charles Wreford-Brown is commonly credited with its origin. Soccer would have been used to differentiate between University sports rugby football ("rugger") and "association" football. Therefore, contrary to popular belief, the word soccer is a British term, not an American one. 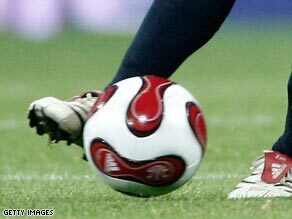 Soccer is more commonly used in countries that play other forms of football, i.e. Americans also play gridiron football and Australians who play "Aussie Rules" football -- a completely different sport entirely. Soccer was initially referred to as football in the United States. In 1913 the United States of America Football Association was formed. In later years, it became the United States Soccer Football Association and today is known as the United States Soccer Federation. Meanwhile they now have the Football Federation of Australia, it's hard to imagine a change to the national side's "Socceroos" nickname anytime soon. The "Footyroos" doesn't quite have the same sound to it. Now, you may be sitting back in Britain reading this and wondering why there should be any debate at all about the name of football? If you are thinking that, just remember one of the most popular shows in Britain is called "Soccer Saturday", so it's not as clear cut as you may think! Even the sport's governing body seems to be open to both options. At next year's FIFA World Cup in South Africa, the area where fans will gather during the tournament is to be called "Soccer City". Maybe the word "football" just doesn't work? We'd like you to tell us whether the game should be called football or soccer and why. Let us know in the SoundOff box below. You can also vote in the quick vote on the Football Fanzone homepage. Or, if you really want to make your case -- why not post us a video or photos at the Football Fanzone page on iReport.com.